I know that everyone has their personal causes and for me, it is defenseless animals. I grew up on a horse ranch with oodles of dogs and cats and countless other species. We sort of became the unofficial shelter for unwanted and abused pets in Las Vegas. I suppose seeing more animal defenselessness and human cruelty than any one person should made me much more interested in helping animals than people. 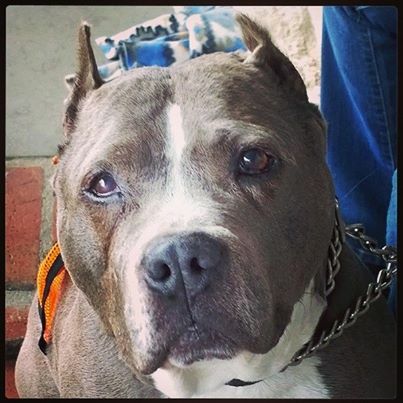 I have tried over the years to keep this kind of stuff off of my blog, but there is a bundle of love in the form of a pitbull named Blew that is in desperate need of surgery and treatment for a cancerous mass. My favorite animal charity All for Love Animal Rescue (AFLAR) needs financial help paying for his care. Please donate if you can. They are so appreciative of any amount and all those dollars will add up to saving a life of a defenseless pup that has suffered enough. More about beautiful Blew…. You really want to please me? Help Blew! It´s always a pleasure to pease Tessa, but this time the reward is double. I hope Blew recovers soon and he gets the home he deserves. Ahhh thank you my sleepy one. This makes me so happy! I’m really so proud of all of you that stepped up to help. I’ve been following Blew’s story and I wish I could adopt him so badly, but my place is just not big enough for him! His surgery is tomorrow!